Another beautiful evening greeted us while walking our dog through Westmount Park. This evening’s late summer’s sunset, colouring the sky, over Westmount Park. A large planter containing the park’s Hawthorn trees. British and Irish folklore contains many accounts of fairies making their homes under ancient Hawthorns. Another “picture perfect” summer’s evening in Westmount Park. Walking our dog through Westmount Park on a Sunday evening. These are various views; however, my favourite is the lagoon taken while standing behind a large Ginkgo tree. A (much) cooler Friday evening while walking through Westmount Park. Another very warm evening during our evening walk through Westmount Park. The “dog days of summer” have arrived! Another walk through the park – only one duckling was spotted this evening – the female Mallard was swimming with twelve earlier in the week – a bit of a worry! One of the unexpected pleasures associated with looking for trees to include in this series is meeting the nicest people with a similar interest! Recently, while walking through Westmount Park, I noticed a couple carrying a (large) field guide to the trees of North America trying to identify a beautiful tree, covered with small fragrant white flowers, next to the park’s lagoon. 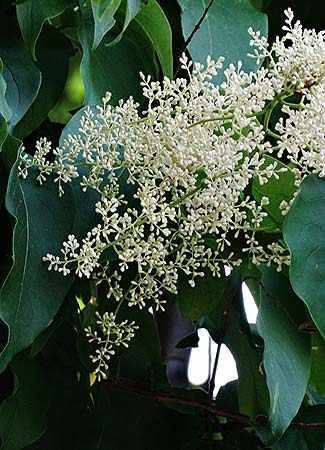 In an unabashed fashion I walked over and suggested it might be a Japanese Lilac; looking at me rather suspiciously, I continued to talk about the Fossil Tree (Dawn Redwood) near the children’s playground and the spectacular Catalpa, in full bloom, directly behind us. Luckily for me, the latter was the tree that instigated their interest to know the names and stories of the other trees that grace our park and others throughout the island. Once they warmed up to me, we looked through their tree guide’s index under “Japanese” – Japanese Larch – Japanese Lime – Japanese Magnolia – no Japanese Lilac was listed. For some reason, the authors (and book editors) decided not to include it within the constraints that comprise the numerous parameters that constitute today’s book publishing industry. What follows is another sample of trees, growing in Westmount Park (including the Japanese Lilac). They are analogous to another dimension, planted in the past, and genetically programmed to live well beyond our lifetimes – until we intervene. Until that point, they reach out to us, as if from our past, to display their timeless beauty. One can’t help but notice the Japanese tree lilacs in Westmount Park. With their beautiful fragrance and small creamy coloured flowers. Look closely, one can see that the flowers grow separately along the stem’s axis (termed a “raceme”) then begin to branch forming “panicles” (a compound raceme). The genus name syringa is from the Greek “syrinx”, meaning “pipe” and describes the tree’s hollow stems. The species name reticulata is from Latin meaning “net-like” describing the vein pattern in the leaves. In fact, the leaves are the defining characteristic of this tree: they are egg-shaped (ovate) and tapered at the tip – they also contain minute hairs (cilia) on their undersides. 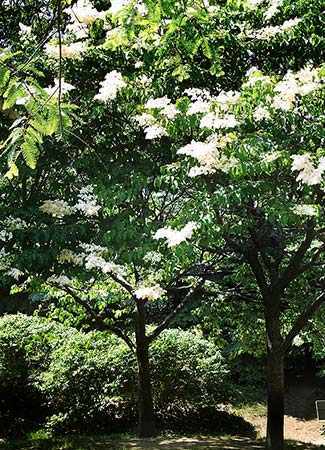 This species, introduced to North America in 1876, is native to eastern Asia, northern Japan, northern China, Korea, and far southeastern Russia and is the only lilac that develops into a tree at maturity. This can be quite a surprise for those presuming they are planting a bush in their garden. Finally, lilac aficionados, by the thousands, attend a celebration held annually on the second Sunday in May (Lilac Sunday) at The Arnold Arboretum of Harvard University. The university’s arboretum contains one of the most extensive lilac collections in North America. 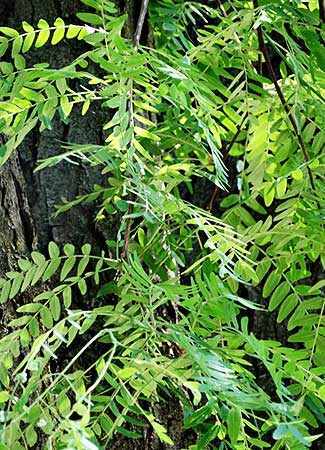 Their genus Gleditsia is named after Johann Gleditsch (1714-1778) the director of Berlin-Dahlem Botanical Garden and Botanical Museum. The species triacanthos translates to “three-horned” – from the Greek treis (three) and akantha (spine) and describes the tree’s thorns. Their native range is the east central United States – from central Pennsylvania to South Dakota extending to central Texas, Alabama and Maryland. They have been widely planted in urban environments replacing elms that succumbed to the fungal Dutch elm disease. 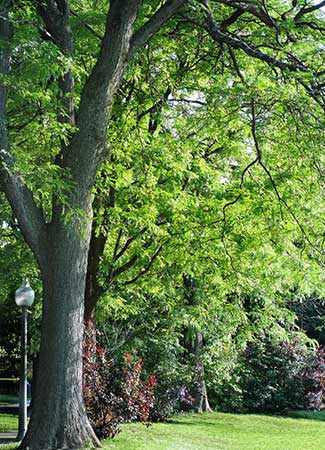 The variety in Westmount Park is a cultivar – selectively bred for the urban environment. Interestingly, their true native counterparts contain massive thorns, in groups of three, that can be over a foot long – coloured like polished mahogany pointing downwards towards from the tree’s trunk. Hardly a species one would want to plant in a city park! In the past, these thorns were used as nails and as pins for tattered uniforms during the American Civil War. A member of the Legume family (common members include beans and peas), the tree develops dark-brown pods, over a foot long, containing hard seeds. Biblical references include John the Baptist who sustained himself in the desert with the pods of the carob or “locust tree”. Early colonists, in encountering this pod-bearing tree, used the biblical word “locust” and the word “honey” to describe the sweet pulp of the immature seeds. In fact, the seeds contain maltose – which is rarely found in plant tissue.